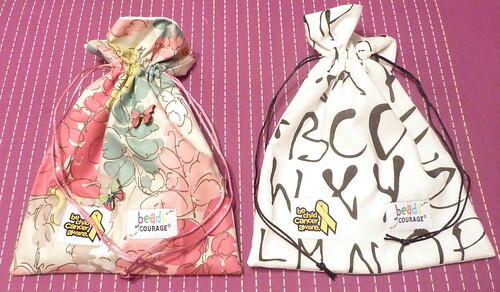 Here are some more bags for Beads of Courage that I made in October. Two in green camo-print and another red car bag. 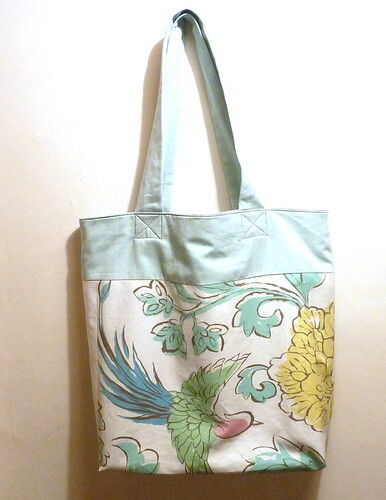 Here we have a swan, a blue and peach swirly feathery design (I have a fair bit of that, in odd-shaped long thin pieces – it’s an 80s possibly-wax-print fabric), and a gold on beige patterned bag. I really love the way that one looks with the burnt orange I used to line it. Rearranged so you can see the feathery one. I’ve just received some Designers Guild kids range samplers (also Scrapstore), and there are some really lovely and cute pieces in there, so I will be making bags from those next. 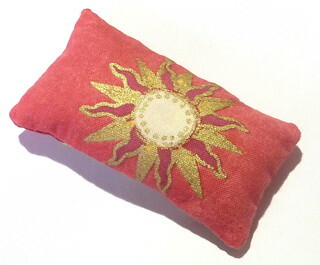 I also made myself a new pincushion – since I have two sewing machines now, I keep finding my pincushion is at the wrong one… (My current pincushion is one I made at primary school – two squares of felt hand-sewn together). This is a Scrapstore fabric that I’m hoarding somewhat since I love the design, suns and planets on red – I decided to use a little bit of it to make something for me. 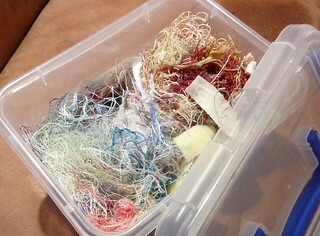 I stuffed it with thread offcuts – I keep those along with trimmed frayed edges and other tiny little unusable scraps in a box for this kind of thing. 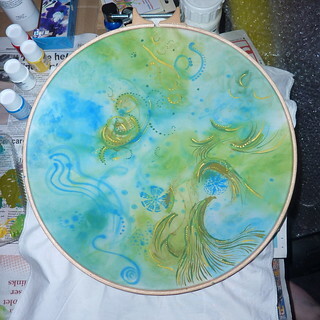 I also did a little experimenting with fabric paints – the ones I used here are Pebeo paints, but I also have medium to add to my normal acrylics, and I have some Procion dyes. 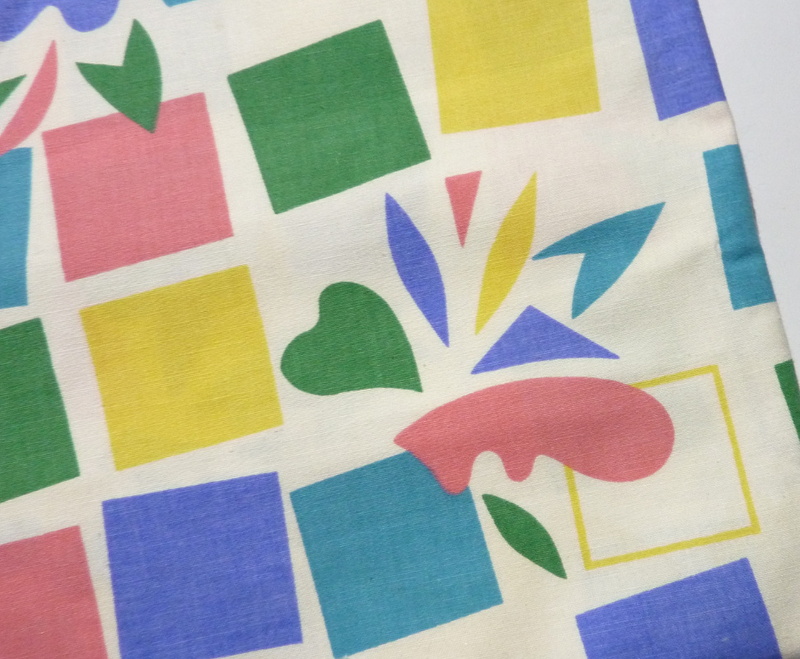 Paint sits on top of the fabric so makes it stiffer – I thought of using dye for most of it and then possibly adding thin lines for illustration with paint, if I want to illustrate it. I was just doodling with this to see how the paint worked. 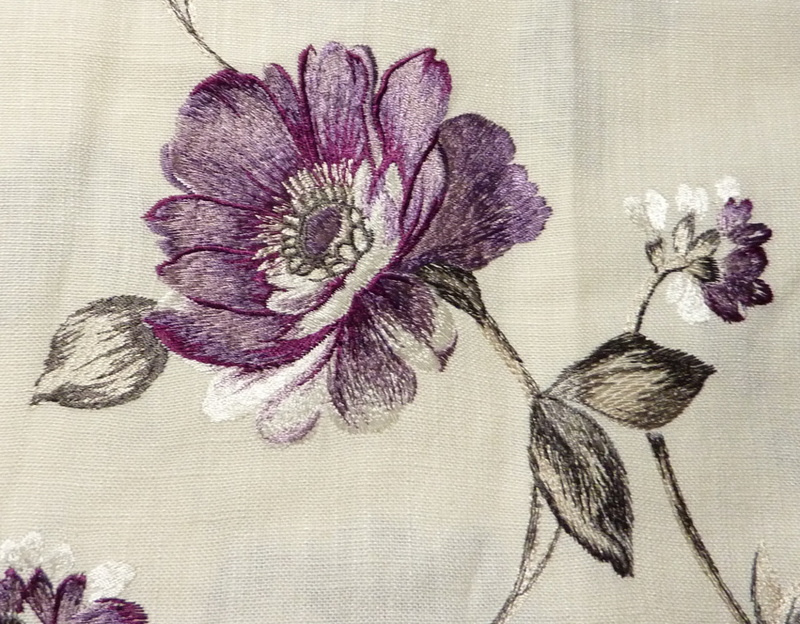 (White fabric also from the Scrapstore). The frame is a quilting hoop that is very handy for this – I noticed that The Works had small hoops when I was there, so got a pair of those too for smaller pieces of fabric. Before I begin, here is my sewing machine! 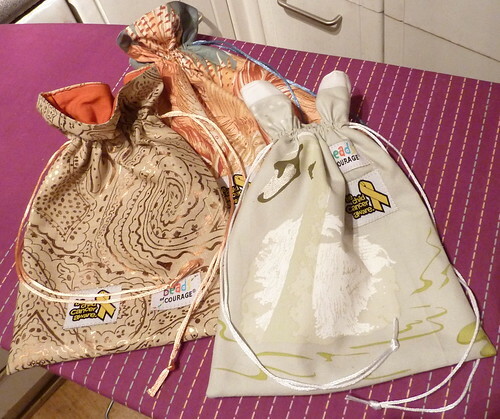 Since I’m amalgamating a couple of drawstring bag tutorials, I thought I’d show you one from start to finish. 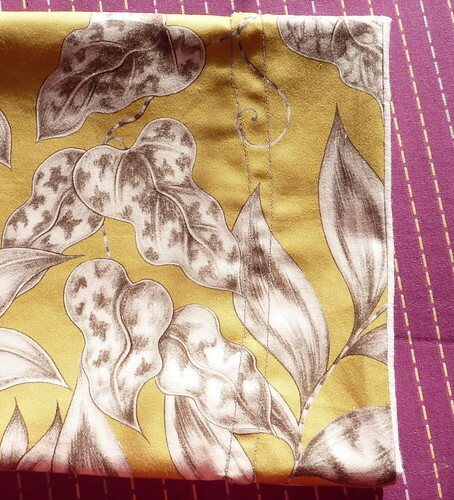 I’m using Scrapstore fabric again – pretty gold/ochre with bird and leaf print, and a white lining. First of all, cut your fabric. 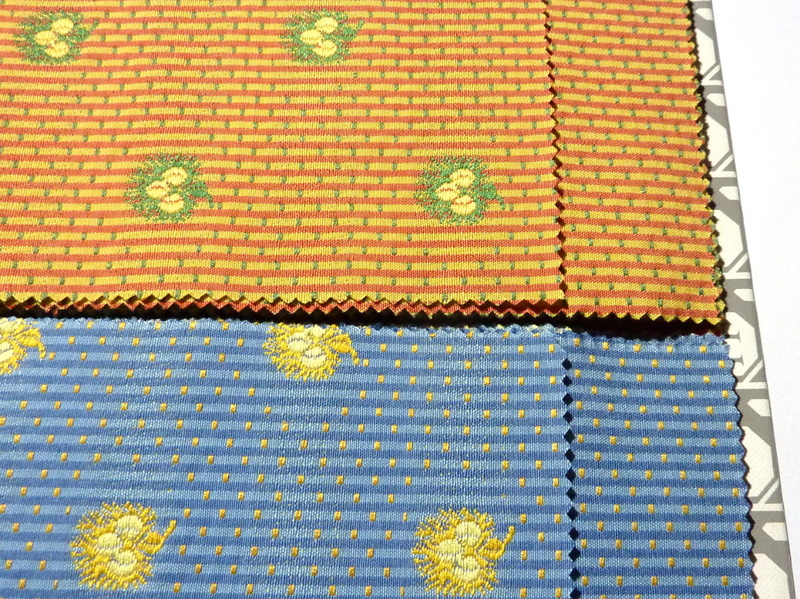 I have two 9×12″ pattern pieces and two 9×12″ lining pieces. 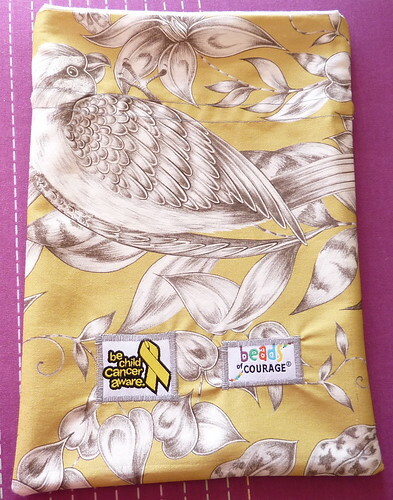 I’ve sewn my Beads of Courage and BCCA badges on to the front (much easier when you remember to do it first!) – just zigzagged all around their edges. You can see I made a measuring grid too – it’s much easier to make sure your right angles remain right angles if you measure with a grid rather than a ruler. Slightly annoyingly, this grid is 11×11″, so I later also made a cardboard template for these pieces that I can just draw around. 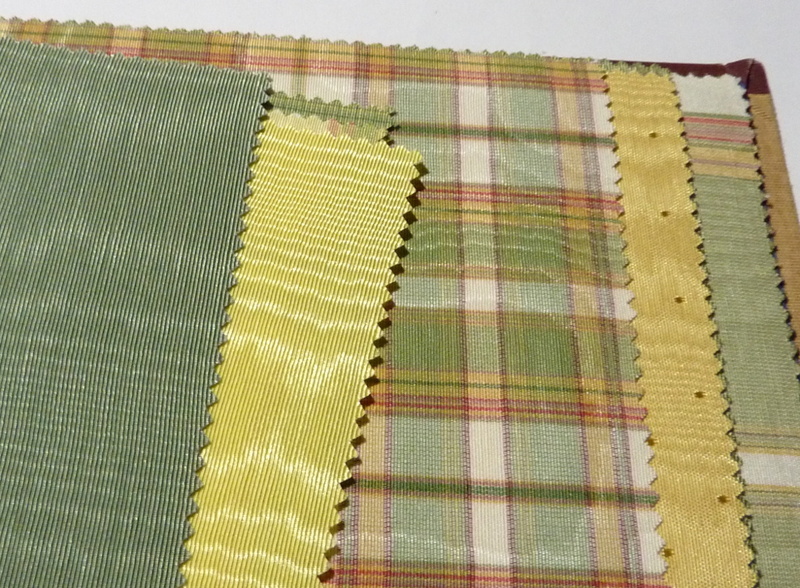 This grid was made with the cover from a fabric sample book. 2. 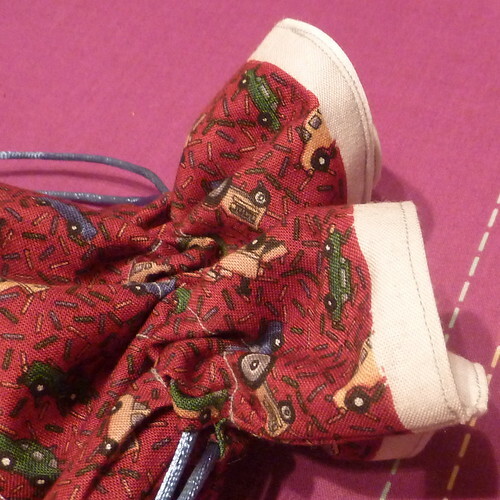 Pin a lining and a pattern piece together along the top, face-to-face. Do the same with the other two. 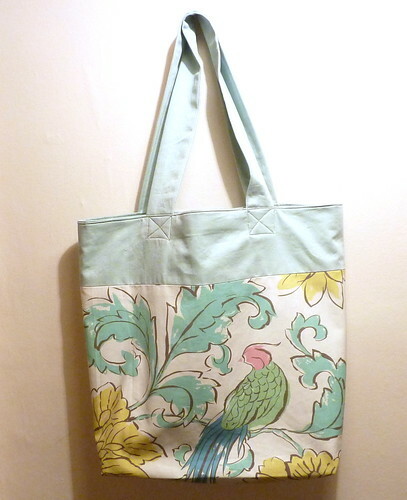 This will be the top of the bag, so make sure your pattern pieces are the right way up. 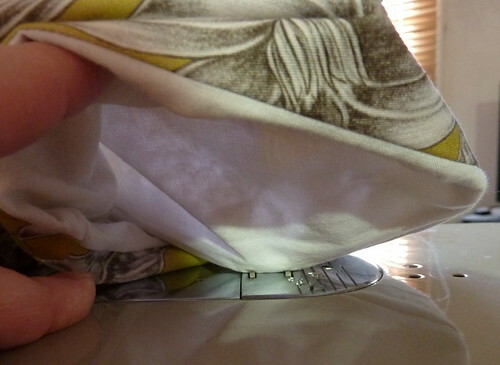 Sew a 1/4″ seam along the top. Do a few reverse stitches at either end to hold it (aka stay-stitches). I also do the trick where you pull on one of your trailing threads and use it to pull the other side through just enough that you can catch it with a needle and pull that thread through to the same size – you can then knot them together and snip them off. You don’t need to do both, I just don’t like cutting off ends on the right side of the piece, so I pull them through to the wrong side if possible. I’ve drawn on 1/4″ seams in pencil all the way round – I don’t always, but it can keep things neater. If your pieces aren’t perfectly the same size, draw your seams so that the smaller piece is on top, since this means you will be able to see the edges when you sew it (and make sure both sides have the same total useful width, or your seams won’t be exactly on the edge creases). I kinda prefer when my initial measurements and cutting don’t have to be perfect, but it does make things simpler if they are reasonably close! 3. 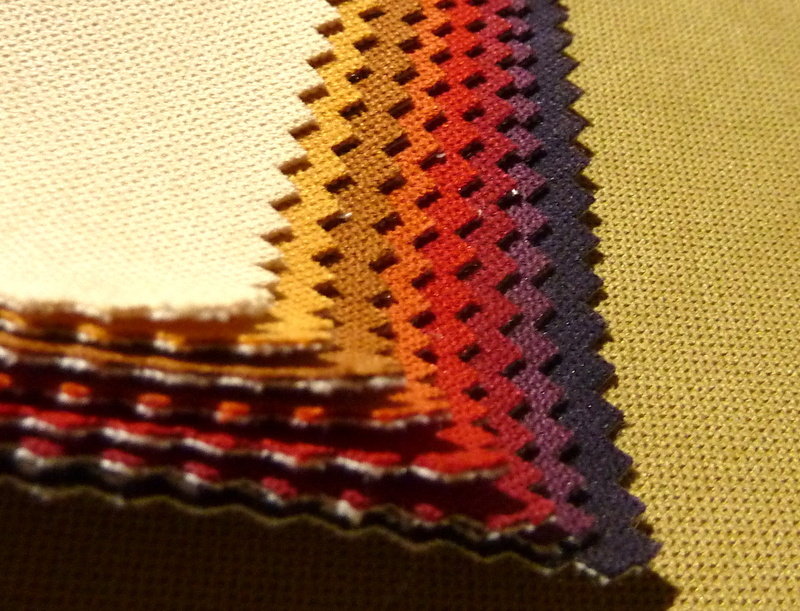 Open up your piece like a book and press open the seam you just sewed. (Repeat with the other half). 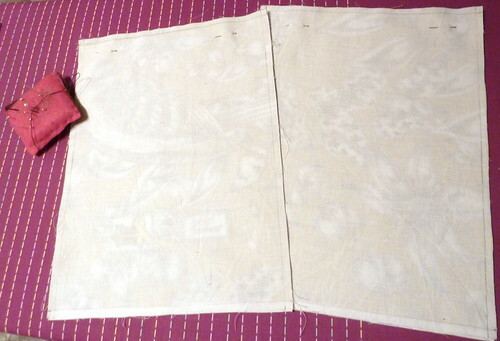 I made the marks for the two drawstring channel gaps on the back (wrong) side of the pattern fabric. 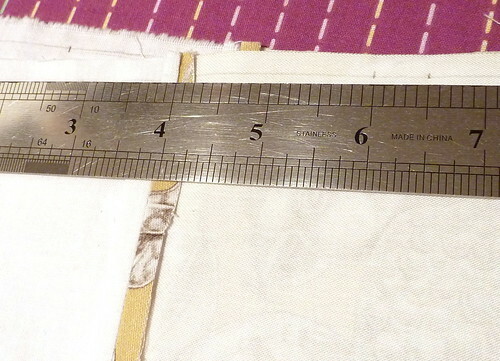 They are at 2″ and 2.5″ from the centre of the seam. 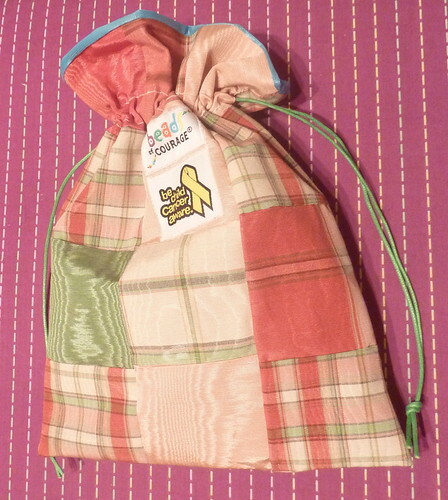 If you move them closer to it, you’ll get a bag that has more usable volume inside it when closed, since the drawstring will be closer to the top. This is up to you – I think these ones look quite nice closed. 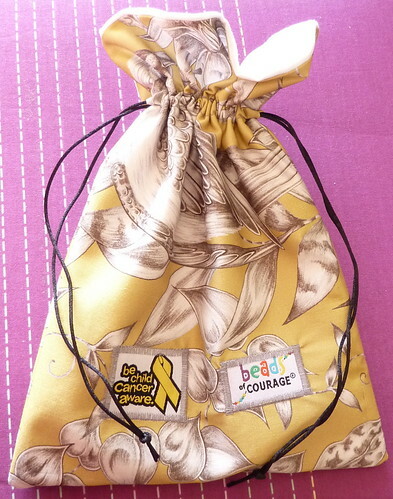 If you are using a wide flat ribbon rather than a round cord, you might want to make the gap bigger. 4. 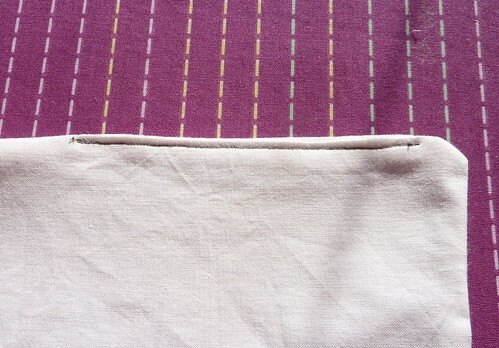 As well as those two channel gaps on the pattern side, leave a biggish gap near the bottom on one side of the lining. You’re going to pull the whole bag through this later to turn it rightside-out. 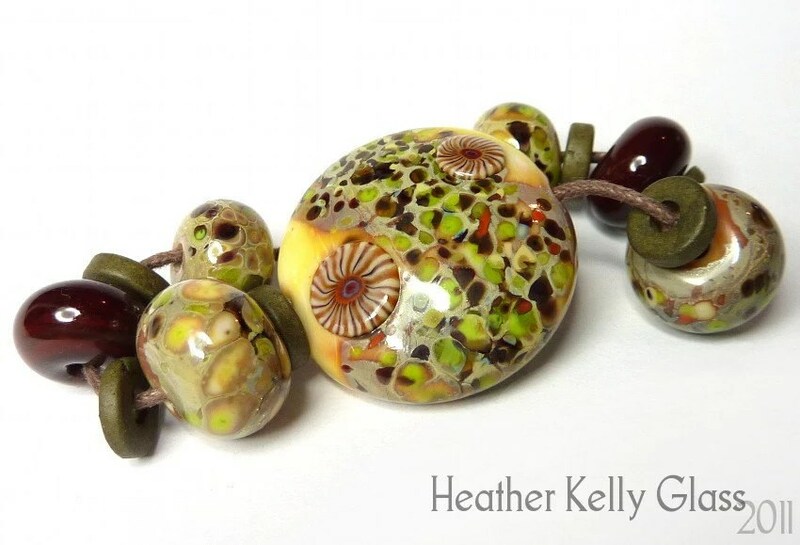 The original pattern suggested leaving this at the bottom – I find it shows less if you have it at the side instead. Place one of your pattern+lining pieces on top of the other, right sides inwards, pattern-to-pattern, and with the seam in the middle lining up. Put a few pins in to hold it together, and sew all the way round, leaving the gaps you just drew. 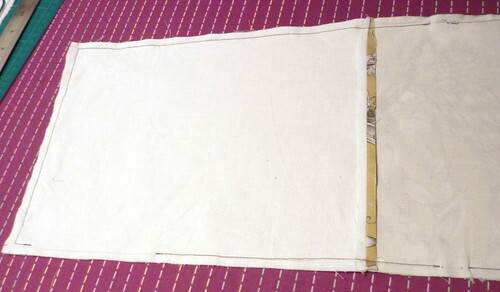 The photo is after sewing – you can see the stay-stitches next to every gap. 5. 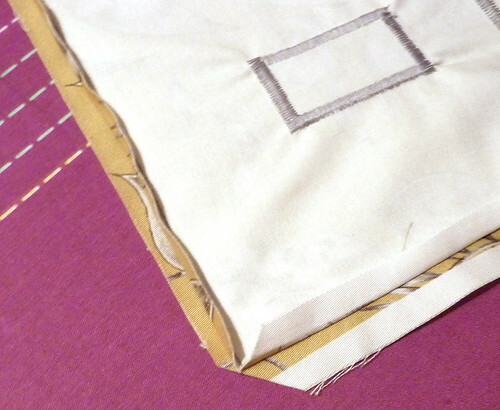 Snip off your corners to remove extra bulk and press all the seams open on both sides. 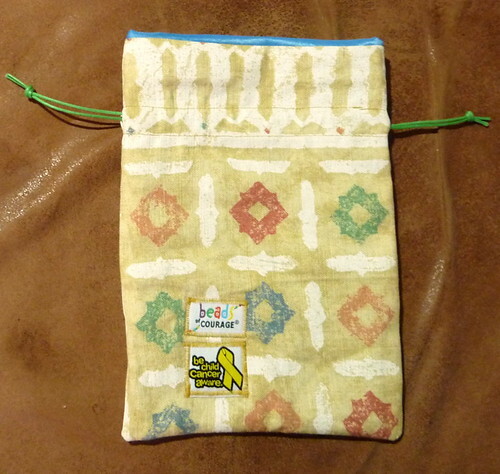 Especially press where the unsewn gaps are, because this will keep them neat and the raw edges inside. 6.Turn the whole thing inside-out through the side gap! 7. This is what you should end up with – use a long pokey thing through your gap to poke the corners fully out (pencil, mandrel…) and press it nice and flat. You now have a closed tube with the pattern at one end and the lining (currently inside-out) at the other. 8. Here is the gap you left, with the neatly pressed edges. The original pattern says to handsew this closed. That does look better, but also takes ages, so instead I just sew straight stitch as close to the edge as I can. 9. The gap is closed! This also shows up less if you use thread that matches your lining, but rethreading the machine a different colour in the middle of the bag is not going to happen. 10. Push your lining inside your bag so everything is in the right place and you now have your proper bag shape. Here’s a pic looking into the bag – you can see the sewn gap if you look for it, but all the other lining seams are lovely and clean. 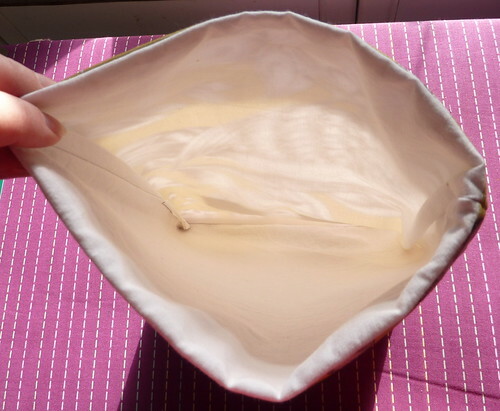 (This is why I moved it away from the bottom – if you look straight into a bag in normal circumstances without stretching it open, there’s some looser fabric at the sides so the bottom is what you see most). 11. Now you have the drawstring channel to sew. I made a couple of bags where the lining was slightly smaller than the outside, and wondered why I kept catching creases on the outside. Then I remembered that the first bag I made, I sewed on the outside when I did the channel and after that I’d sewn on the inside. Sewing on the outside means that you can keep the outer smooth, and if you do have any mismatches you can catch them inside or have a tiny extra fold at the seams. 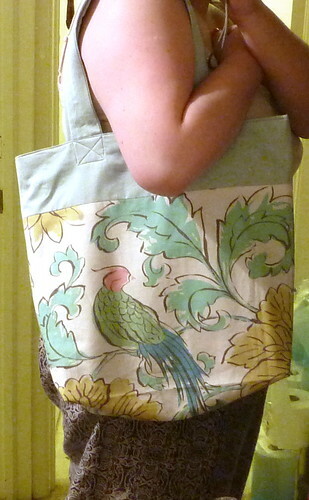 So, you’re going to sew around the top of the bag like this, keeping the area you’re currently sewing on nice and flat. Start at the edge of one of the gaps you left in the pattern fabric seam. 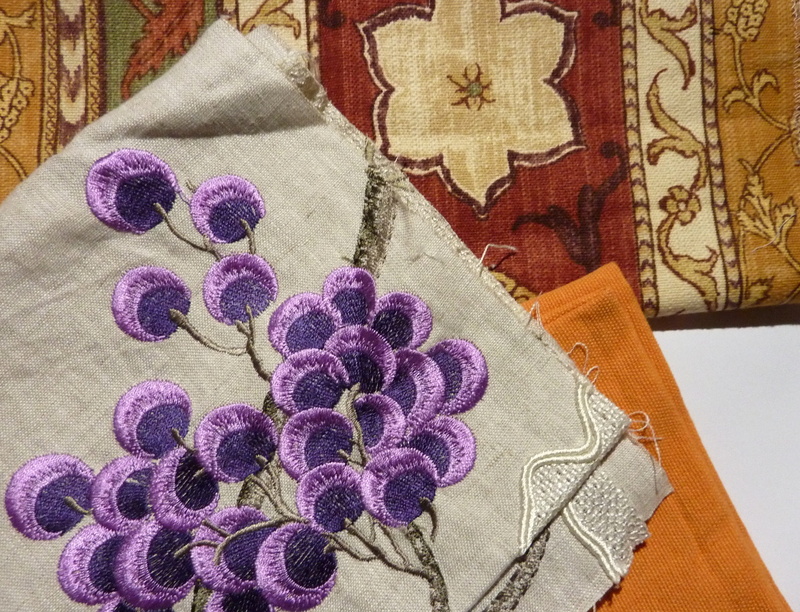 It’s easier if you draw a line on the outside to sew along too – I didn’t do this here. 12. 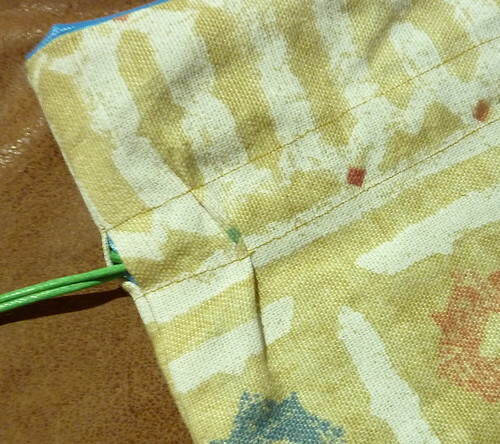 Here’s a view from underneath the fabric where I’ve lifted it up so you can see where the foot is holding it down – I don’t have a free arm so have to be careful to keep the other side of the bag well out of the way and not sew the two together. 13. Sew all the way around the top and bottom of the channel, enclosing it so your cord can’t go anywhere else. 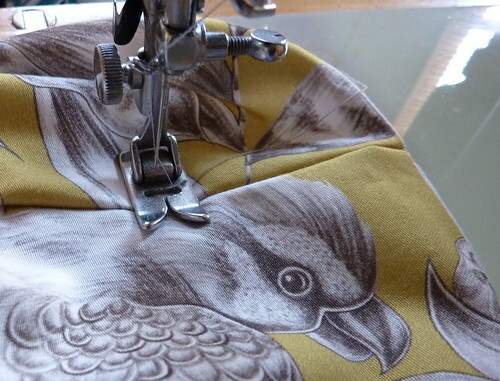 Pause often and pull more fabric round towards you so you always have a reasonable amount to be sewing on. Eventually you will be back where you started and can stay-stitch to finish. This is why you might want to draw a line… I ended up with rather a curved channel on the back. I don’t have any tailor’s chalk so just use pencil, which can take longer to remove and is why I didn’t draw one here. I got my front side nice and straight, though! 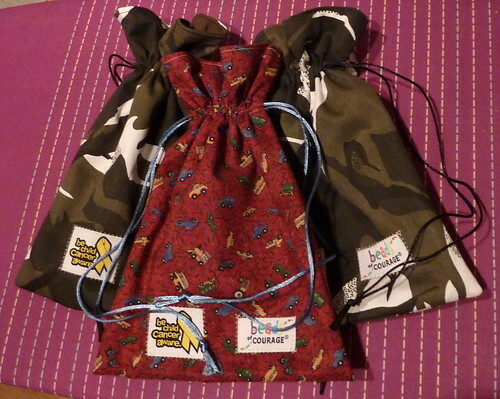 And a drawstring bag is rarely completely flattened out when in use, so you won’t notice the curve most of the time. 14. Add your cord. Put a safety pin through one end and go in through one of the side gaps, all the way round and out again. Then repeat for the other side. Tie your cord ends off and there you are. 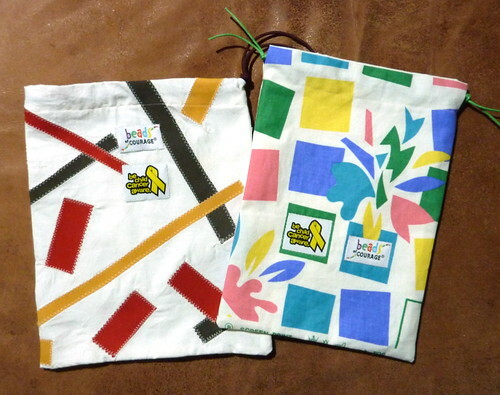 Here are a few previous bags. In the closeup you can see what I meant about catching a fold when sewing the channel from the inside. 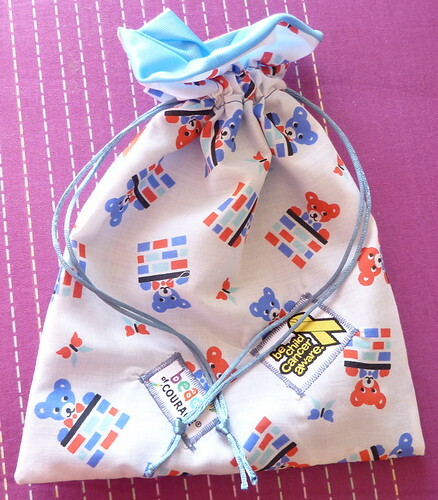 This one below was not Scrapstore fabric – the teddies came from eBay and the blue lining is 100% polyester that actually makes a pretty good lining for a bag like this (also used as the lining just above). 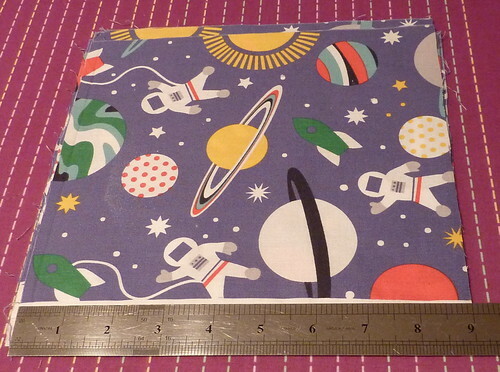 I saw this spaceman fabric in one of the little theme bundles at the Scrapstore and grabbed it because it is perfect for BoC bags! There tend to be a lot of florals, other nature-themed prints and elegant patterned upholstery fabric there, but things like this are rarer. 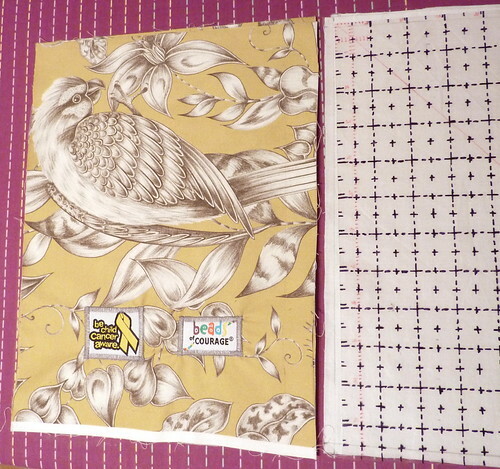 The pieces aren’t big enough to cut a full 9×12″ piece so I will combine them with another fabric. 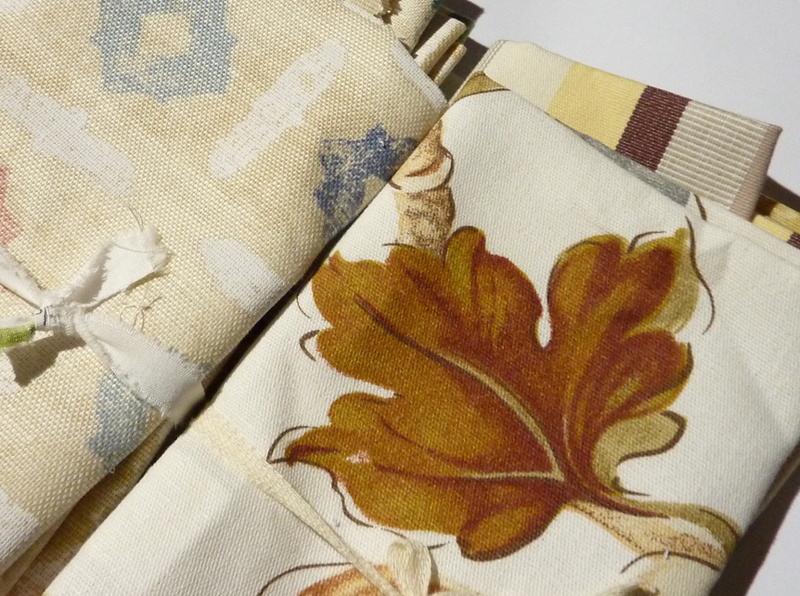 Sewing updates, after my post on UK Scrapstores. Here’s what I’ve done with some of the fabric. 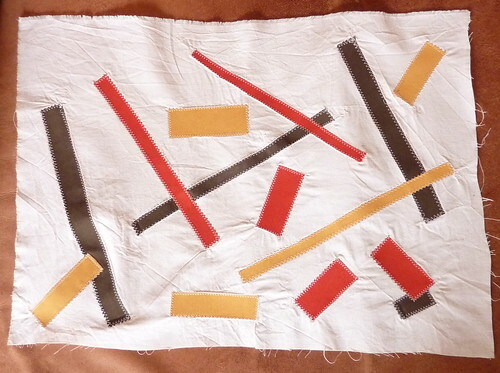 I started off by cutting out some bits from solid-colour samples and appliquéing them onto a white cotton background. (Probably should have ironed it a few more times in between and/or sewed more carefully – I have a bit of gathering in my white). 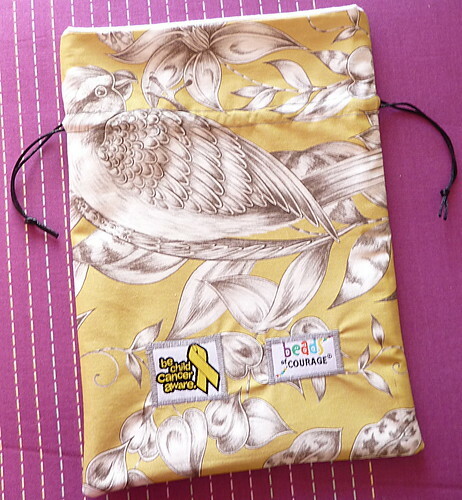 Then I made it into a drawstring bag, using the pattern at LoveMeSew. 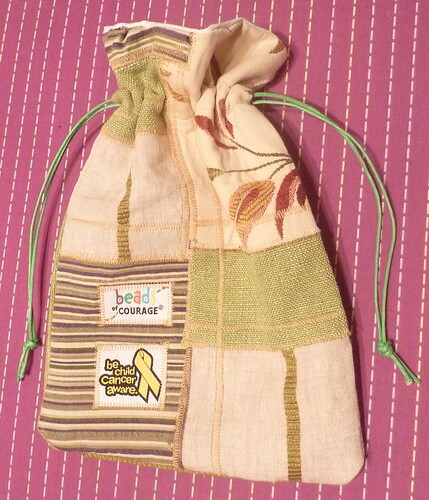 That pattern is made from a single piece of fabric and has a gap at one side for the drawstring. 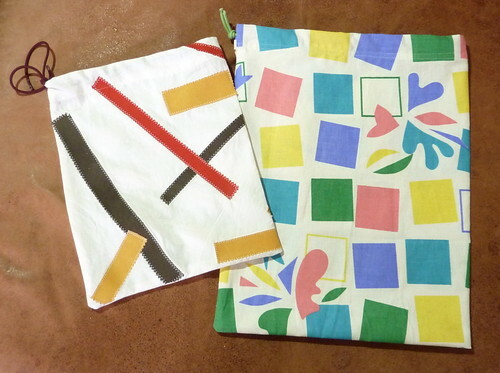 The bag with the squares was made using the same pattern, but is kinda big! This is because I looked at the BCCA instructions for sizes, and it asks for two 9×12″ pieces of fabric, so I went “Oh, since I’m using a single piece, twice that is 18×24 inches”. No, no it isn’t. 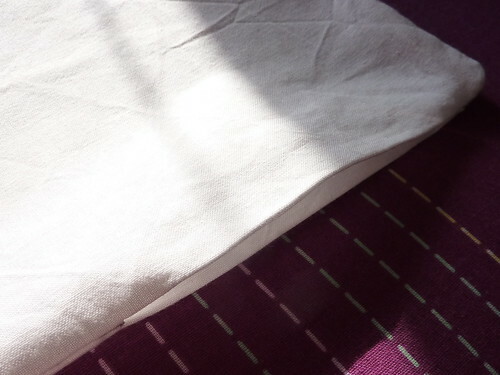 I used the white cotton for the lining and the same square pattern fabric for the outside. It’s pretty solid-feeling once you have both layers! All the hems are tucked away between the layers, so it looks well-finished too. 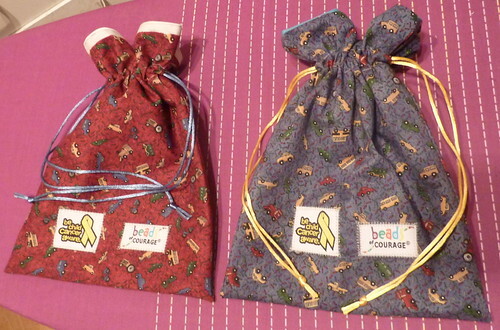 You can see I’ve also sewn on the BoC and BCCA badges for these bags. 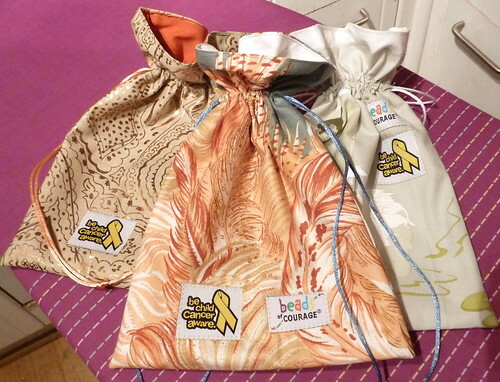 (Be Child Cancer Aware will send you some if you’re going to make them bags – you can contact them on FB). For my next trick, I’m going to try BCCA’s pattern for the bags – the LoveMeSew one involves sewing the linings together and the outers together, so you have a fully closed tube with lining on one side and outer on the other, then you turn the whole thing inside-out through a little gap left in the lining and hand sew that closed at the end. The BCCA pattern has you sewing the lining and outer into tubes from the start and turning them back and forth – it was rather confusing, so I went through it with pinned fabric only and think I have a better idea. I will see how the time taken and finish compares, and which way I like better. Anyway, so far I have only had to unpick a very few sections, and pricked my finger once when hand-sewing the badges on my first bag (I had them before making the second, so could do that one by machine). Success! Sample book contains a rainbow! This post has been sitting here awaiting the photos for a month or more, so here we are! I decided I’d get round to getting a sewing machine this year. 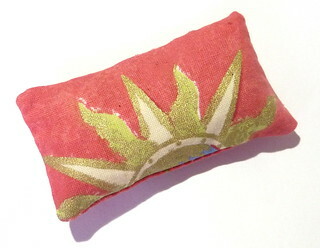 I recently joined the Wandsworth Work & Play Scrapstore (http://www.workandplayscrapstore.org.uk). A friend of mine volunteers there. They have loads of all sorts of other stuff: white card, rolls of wallpaper, colour-coordinated boxes of plastic lids… There’s a section with loads of Christies auction books, and for people who do book art there are green and gold bound Dickens novels and the like. For this store, you pay an annual membership and can then take as much as you like during that time. Some things are limited on the amount you can have per visit. You can join as a student, a family or a larger organisation like a school. Or speak to them if you’re not sure you fit in the categories. The rule for this store is that everything has to be for personal use – you cannot sell it or things made from it. Yearly membership for individuals is tiny: £36 for a family, and there was a 20% discount when I joined. (They have a static year rather than a rolling one right now, so my membership is until the end of August). They want more members so tell anyone you think might be interested! For their records, you give them an estimate of the value of everything you’re walking out with (they help with this). We reckoned I had at the very least £150-worth of fabric I was lugging out with me, and that was probably on the low side. To get there: From Wimbledon station, you can get the 493 bus from stop A on Alexandra Road and go 7 stops in very short order which deposits you right outside (Hazelhurst Estate stop). It isn’t immediately obvious: on exiting the bus, turn left and go a few meters along until there’s a driveway. Turn up that and walk to the gap between buildings: they had a sandwich board up there and the entrance is just on the left. You may need to buzz. Children under 12 aren’t allowed to go among the stacks (potentially hazardous) so would need to stay in the entrance. Open Tues and Thurs only. There are scrapstores all over the place, have a look at https://www.scrapstoresuk.org. They are each run individually, so have different rules for membership or whether they have members at all. Because of the opening hours I can only go there when I’m on holiday, but since it was more than worth it for one visit, that’s not really a problem! 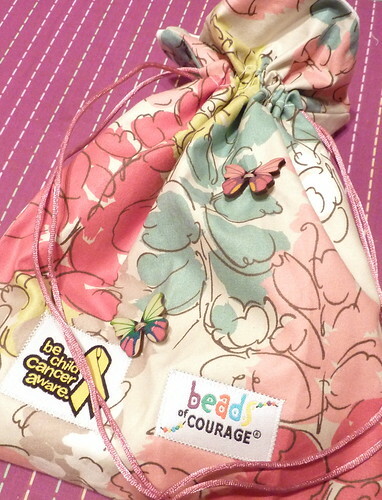 I am intending to begin by making some bags for Beads of Courage UK: the kids need bags to keep their long strings of treatment beads in, and it seemed a handy and fairly simple project to begin with. 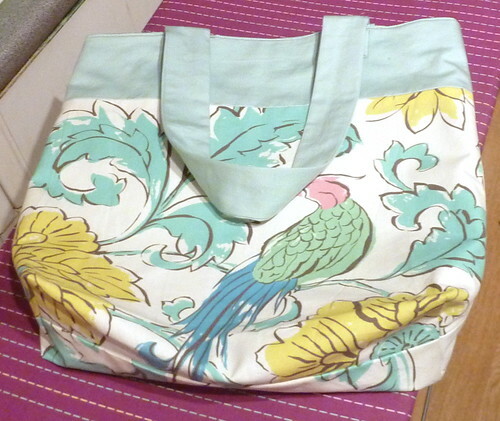 I like this tutorial: How to make a simple drawstring bag from Love Me Sew. 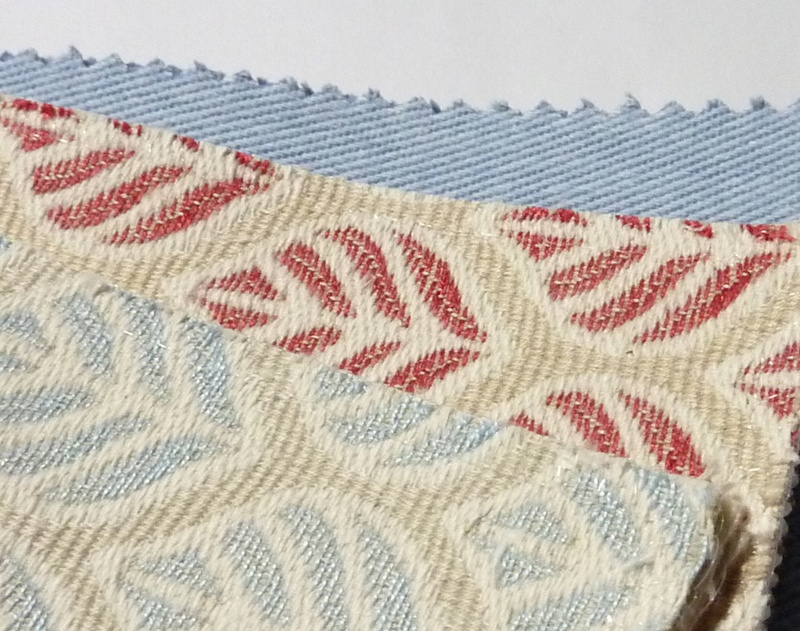 As of now, I’ve washed and ironed various of the fabrics I bought. Yes, I had to buy an iron and ironing board for this. (Aside: I could get an Argos value iron on sale for £2.99. The only ironing board I could find was from TK Maxx at £24.99 and has a 10-year guarantee! Insert something about disposable electronics here. The board is rather nice though, adjustable with plenty of height). 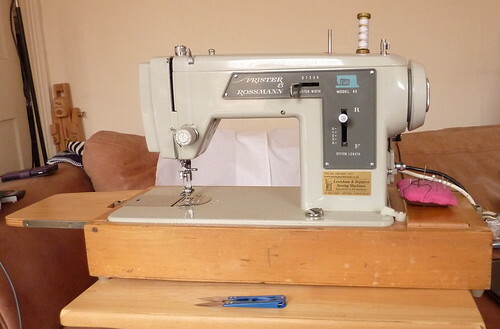 My sewing machine is a nice hefty metal-bodied secondhand Frister & Rossmann Model 35. No bells and whistles, but I wanted one that wasn’t plastic and would do a small number of things reliably to begin with. I’ve been making friends with it by trying out all the stitch adjustment options, rethreading the machine in white (came with black), filling a new bobbin and overcasting the edges of my fabric so it doesn’t fray. (Which is actually a decent exercise to get used to using your machine and controlling the speed, going in a straight line etc).